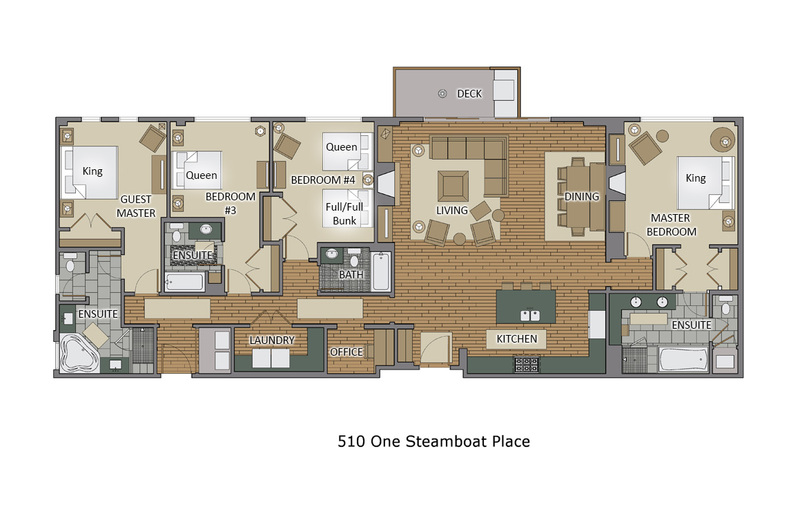 One Steamboat Place offers luxury, ski-in/ski-out access, and amenities that are all unparalleled. The Grouse Mountain Residence bathes in natural sunlight bouncing off of the surrounding One Steamboat Place Plaza. Sitting on the fifth floor, the Grouse Mountain Residence has a bird’s eye view of the outdoor fire pit in the One Steamboat Place plaza below. The open floor plan connects the living and dining areas to the kitchen with plenty of room for the entire group to gather. Rest and relaxation is the name of the game with the comfortable furnishings in the great room while enjoying the fireplace. The kitchen is professionally equipped with Viking appliances. From the deck, you can grill on your gas BBQ as you look past the clock tower that sits atop the Steamboat Gondola building to watch skiers and riders make their last few turns at the base of the ski area. This residence is designed for entertaining, with enough seating at the dining table for the whole family and more room at the kitchen island. The master bedroom is a true retreat sitting alone on one side of the residence. Along with a gas fireplace and King bed in the bedroom, the main master bath features a steam shower and Jacuzzi tub. On the other end of the residence you will find the Guest Master with a King Bed sitting alongside a third bedroom with a Queen, and a fourth with a Queen and Full bunks. All bedrooms have private bathrooms. Wonderful unit – Well maintained, lots of amenities, best location. Unit was in great shape. Staff at One Steamboat Place are great. Wonderful place to vacation while at Steamboat. I've spent months in Steamboat and this was the first time I stayed at One Steamboat. Everything about this place is luxury. There are so many amenities that I don't know where to begin. Often times ski in ski out means you have to walk and it's kind of close. At One Steamboat you walk downstairs to a beautiful locker room and there is attendant waiting to help you with your boots and make sure your skis are waiting outside. The kid's ski school is also about a two-minute walk from the property. On the way back in from the slopes, you ski down the mountain and they will take your skis slopeside at a designated area. They make it so easy and remove all the hassle. The unit is beautiful and has a woodsy, elegant modern decor. There is a stunning dining room table that must seat 12 and a gorgeous fireplace in the living room and master bedroom. It has all the amenities you would expect in a luxury residence. Viking appliances and steam showers are just a few. The service was as good or better than you would expect at properties like the Ritz or Four Seasons. The people are so nice- everyone from the drivers to the concierge is just a pleasure to interact with. My wife and I actually commented saying why is everyone here so nice! They have a car service at no charge to take you anywhere you want to go. We used it daily and can say we never waited more than 3 minutes. We would walk downstairs and there was always someone waiting to take us where we desired. My kids asked every day after skiing if we could visit the game room. Ping pong, table hockey, oversized connect four, pool table and more made this a really fun spot for our family. Of course, they have a beautiful pool (heated just right to use in the winter) and 3 hot tubs on the property as well. In addition, they have an incredible spa, fitness center and tons of activities happening. Apres ski is great. Hot chocolate for the kids (mine were averaging a couple cups a day) plus wine, beer, and apps for us to enjoy. They even have a nice spread for breakfast if you don't want to bother stocking the residence with groceries. The location is just incredible. You can walk downstairs and have a quick casual bite with the kids or a 5-star romantic meal at a top restaurant. I can't say enough great things about this property and Steamboat in general. Like I mentioned this was my first time staying at One Steamboat and it would definitely be tough to stay anywhere else!